Blue Mars is the third volume of the Mars trilogy. It was first published in 1996. Of much greater scope in space and time compared to the first two volumes, Blue Mars follows the characters we have come to know and love as Mars achieves independence and social justice and is successfully turned into an Earth-like planet that sustains life. Green Mars is the second volume of the Mars trilogy. It was first published in 1993. After the failed revolution in Red Mars, the survivors gather in the Martian underground and plan for the day they will achieve independence from Earth. But the agendas of the numerous groups of the underground differ greatly. Red Mars is the first novel of the Mars trilogy, published to great acclaim in 1992. It tells of the beginnings of the colonization of Mars, the beginnings of the efforts to terraform it and the tensions resulting from corporate forces from Earth exerting their influence on the developing Martian culture. In a future California after a revolution in legislature, an ecological utopia has been reached. But greed and grief still exist. The Gold Coast is part of the Orange County trilogy. It was published in 1988. The Memory Of Whiteness is a science fiction novel published in 1985. In the far future, the adventures of a man playing a unique musical instrument, the Orchestra, as he travels through the solar system. Icehenge is a novel published in 1984 consisting of three stories that are connected through time: two previously published short stories and a third one. Human civilization has to cope with space travel, memory loss brought about by a life span expanded to a thousand years, and historical revisionism. The Wild Shore was published in 1984. 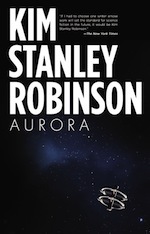 It is Kim Stanley Robinson's first novel. It is part of the Orange County trilogy. In an America "after the fall" in the future, the coming of age story of a young man living in a pastoral village in California.